These delicious, slightly crumbly flapjacks are quick and easy to make. The addition of the mincemeat and cherries keeps them moist and adds the colour and flavour of Christmas to a simple flapjack recipe. Preheat the oven to 180°C, gas mark 4. Place the mincemeat, cherries, butter and syrup in a pan and heat gently for 3-4 minutes or until the butter has melted. Remove the pan from the heat, stir in the oats and mix thoroughly. Spoon the mixture into a greased 18 x 28cm rectangular tin and press down with the back of a spoon. Bake in the oven for 20-25 minutes or until lightly golden. Mark into 18 squares and allow to cool completely in the tin. When the flapjacks are completely cold, cut into squares using a sharp knife and store in an airtight container. The flapjacks will still be soft when they are cooked and come out of the oven. They become harder and crisper as they cool. 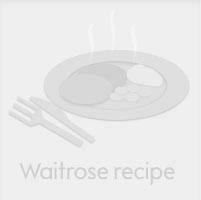 For a special occasion, substitute Waitrose Traditional Recipe Mincemeat for Waitrose Special Recipe Mincemeat. These flapjacks would make a good gift-wrapped Christmas present. Or why not get the children to help you make them for the school Christmas bazaar. This recipe was first published in November 2001.